Anyone on board a PWC is required to wear a U.S. Coast Guard approved Type I, II, III, or V PFD. Inflatable PFDs are not approved for high impact water sports such as water skiing or riding on a PWC. According to Federal Law, all boaters or passengers under the age of 13 must be wearing their PFD while the vessel is underway unless they are below deck or in an enclosed cabin. In Virginia, this rule is enforced by the U.S. Coast Guard and applies on waters over which they have enforcement jurisdiction. Mandatory enrollment in The Virginia Alcohol Safety Program. By operating on Virginia waterways, an operator is deemed to have given consent to a breath and/or blood test to determine the amount of alcohol and/or drugs in their blood. Refusal to submit to a test may constitute grounds for the revocation of the operator's boating privileges. "Zero Tolerance" prohibits persons younger than 21 from consuming alcohol and operating a vessel with any measurable alcohol level. 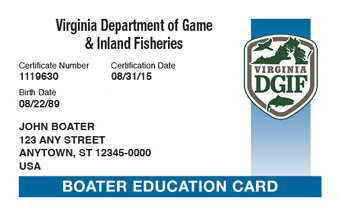 The Virginia Department of Game and Inland Fisheries (DGIF) is responsible for regulating the state boating laws in Virginia. All boats propelled by machinery, including gasoline, diesel and electric motors regardless of whether or not the machinery is the principal source of propulsion, and principally operated on Virginia waters must be registered and issued a Virginia Certificate of Number (Registration) by the DGIF. In addition, all motorized vessels requiring registration must be issued a Certificate of Title before they can legally be operated on Virginia's waterways. This also applies to any sail-powered vessel in excess of 18 feet in length even if they do not have a motor. Watercraft documented by the United States Coast Guard cannot be titled, however the owner of a documented watercraft may apply to DGIF for a state registration decal. If a boat has been previously registered in Virginia, the new owner may operate the vessel for thirty days from the date of purchase with a dated bill of sale and the valid Certificate of Number of the former owner. Title, registration, and license plates for your watercraft trailer are purchased through the Virginia Department of Motor Vehicles (DMV). It is valid for three years and must be renewed at the end of the third year. It must be signed and carried on board when operating the vessel. The number issued to a boat appears on the certificate and is to be displayed on each side of the forward half of the vessel. Decals are furnished with each Certificate of Number and indicate the month and year of expiration and the registration number assigned to your vessel. 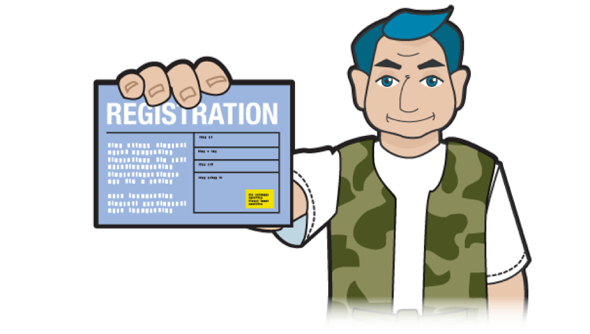 The decal must be displayed within 6 inches of the registration number on the boat for which they were issued. Only the current decal may be visible. Letters must be separated from the numbers by a space or a hyphen (the separation must be greater than the width of the letter I or the number 1). For example: VA 1234 BX or VA-1234-BX. This is a federal and state requirement. Make sure all boats are properly marked and documented. It is important to keep your papers with the boat – be particularly aware when transferring ownership of your vessel. Non-native aquatic species, plants, fish and animals are invading Virginia's waters. These pests can increase dramatically under the right conditions, displacing native species, clogging waterways, and impacting navigation and recreation. Once introduced, they are nearly impossible to eliminate. Hydrilla, Egeria Densa, water hyacinth and zebra mussels are nuisance species that can be accidentally transported by recreational boaters when caught in propellers, intakes or attached to hulls. Dispose of the plant fragments on land, in a garbage receptacle. Report any new infestation of non-native aquatic species to the U.S. Fish Wildlife Service. To stop the spread of aquatic species, it is best to clean your boat before you leave the body of water. Do not underestimate PWCs – they are very powerful for their small size and demand the same respect as any boat. In fact, PWC operation must adhere to the same rules and regulations as any other powerboat – including registration with the state and a B-1 class fire extinguisher aboard. Every person on board and anyone being towed behind a personal watercraft (PWC) must wear a Coast Guard approved Type I, II, III or V personal flotation device (PFD). Inflatable PFDs are not intended for use while participating in tow sports or other high impact sports, and do not meet the wear requirements for PWC operation. PWCs must come to "no wake" speed when within 50 feet or less of docks, piers, boathouses, boat ramps, or people in the water and vessels other than personal watercraft. This does not prohibit the pulling of a skier with a rope less than 50 feet. Personal watercraft may only be operated during daylight hours (sunrise to sunset). Note: No person 13 years of age or younger may operate a PWC. PWC operators who are 14 and 15 years old must have proof of successful completion of a NASBLA-approved Boating Safety Course. The Boater Education Card must be carried on board at all times while operating.